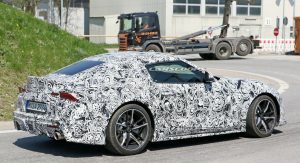 The Toyota Supra is continuing its slow march to production as spy photographers have managed to catch another prototype undergoing testing in Europe. 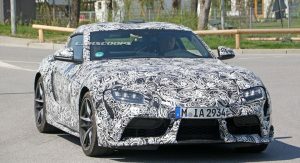 Set to become one of the sportiest Toyota vehicles ever created, the Supra was previewed by the GR Supra Racing Concept which recently debuted at the Geneva Motor Show. 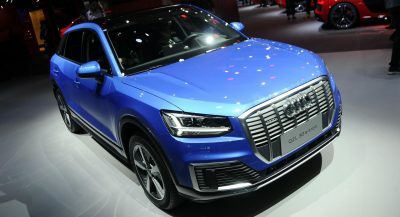 As you can see in the latest photos, the production model will be more conservative than the concept but a number of styling details will be shared between the two models. 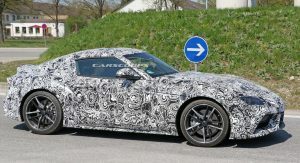 Starting up front, we can see the Supra has slim LED headlights which carryover from the concept. They are surrounded by small air intakes that will likely improve brake cooling. The Supra also features a sporty front bumper with an integrated splitter that has angular tips on the outside edges. Moving further back, we can see a relatively long hood, a rakish windscreen and a double bubble roof. A closer inspection reveals aerodynamic side skirts, two-tone alloy wheels and a compact greenhouse which amplifies the sporty styling. 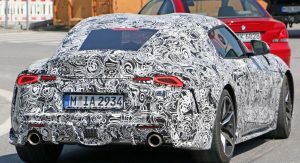 The rear of the Supra is heavily camouflaged but the muscular rear fenders help to emphasize the Supra’s rear-wheel drive layout. The model also has an integrated rear spoiler, slender LED taillights and a ventilated rear fascia. 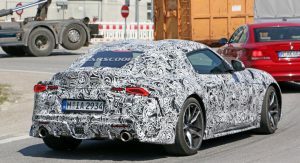 Other highlights include a Formula One-inspired third brake light which is located in the rear diffuser and is flanked by two large exhaust tips. 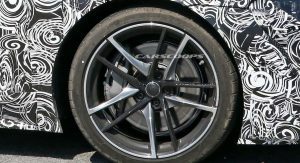 We’ve only seen a few glimpses of the interior but photos have shown the model will have a three-spoke sport steering wheel with prominent paddle shifters. 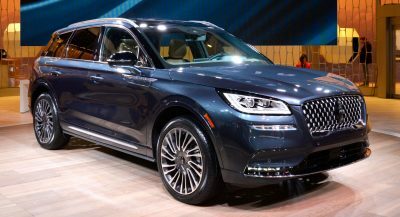 The car will also have a digital instrument cluster, metallic accents and digital displays for the climate control system. 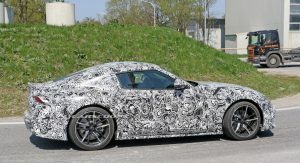 The Supra and its cousin, the BMW Z4, will reportedly be built by Magna Steyr. 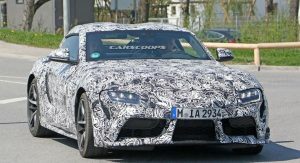 The first Supra models are slated to roll off the assembly line early next year with a BMW-sourced six-cylinder engine. 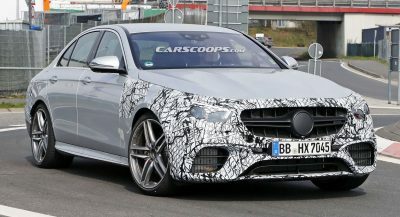 There have been countless rumors about how much power the engine will have as some publications are claiming around 335 hp (250 kW / 340 PS) while others suggest up to 450 hp (335 kW / 456 PS). 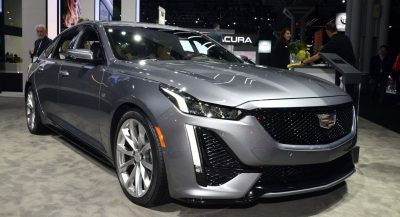 This thing might be a even larger disappointment to some than the current Toyobaru twins with ending up a BMW Z4 with a different body and some kind of hybrid assist. 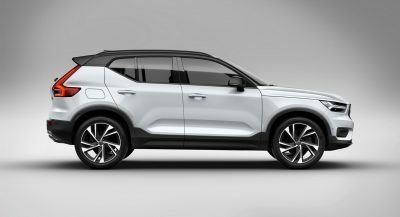 With that said any enthusiast focused car in today’s CUV crazy market is a welcome addition. Funny, the Supra isn’t yet available, and I’m already so over it! Same here. Enough with the spy shots already. And it seems by the time it launches it’ll sport somewhat outdated tech and be quite expensive. Not exactly a recipe for success out of the gate. 1. 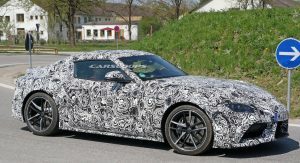 It’s hilarious that Toyota says the new Supra will be different from the Z4- yet in most of the “spy” pics its running with BMW’s. 2. 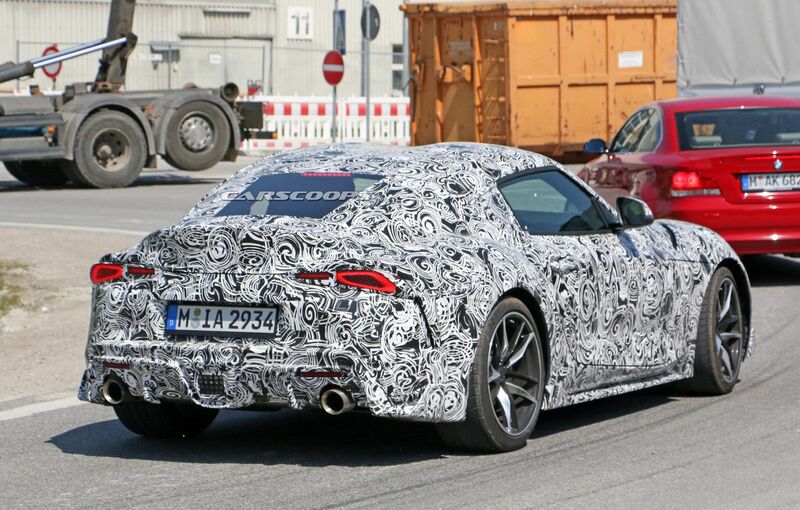 The car looks like an update version of the last BMW Z4 coupe. 3. Why would BMW give this car away when they need a damn sports car, i.e. 911 competitor. 4. Why would Toyota give their MOST iconic car to others to engineer and build? 6. 1 thru 4 (above) doesn’t matter because the car will be legend. Is it just me, or does this car look overly tall? Now that you mention it yea. Time for a refresh. This is Toyota’s version of the NSX. DOA. I’d lower those prices by $15k each. Just unveil the damn car already, Toyota…. It’s a BMUPRA .. not a Supra.. The length of the car is too short. It will look like a joke parked next to its legendary rival the GTR. Toyota should also stop using the designs from their Calty design studio, the cars do not resemble the cars that they are replacing. They do not carry over any of the genes from the previous model. at last i got the point of never coming supra,all these news are clickbaits.i am never going to click till i see the car itself,so.. 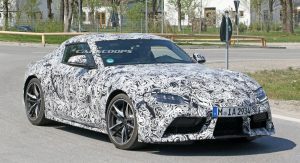 The most underwhelming non exciting prequel to the new generation long awaited Supra. The ignorance in this discussion board is not a surprised. They aight. Really could do SO much better though. Little details like beautiful wheels can really set off sports car design. I hope there are other options. They did the exact same with the FRS/GT86. The concept was beautiful, like this FT-1 and, well, you’ve seen the boring looks on the production car. 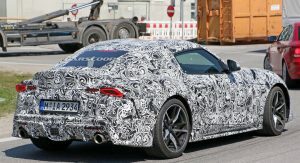 This new gen Supra was essential a blank-slate project and should’ve been made true to the FT-1 concept. Instead, it seems to look like some chubby cartoon version of it.